Plumbing magnate Herb Kohler wanted to expand the already-brisk golf business at his popular resort, Destination Kohler, near Sheboygan, about an hour-and-change from Milwaukee, Wisconsin. He had 36 holes on the resort proper, but then found 560 lakeside acres about ten miles northeast of the resort itself. The land was a former army base that had operated as an anti-aircraft weapons firing range during World War II. Though the property was an ecological ruin filled with asbestos, toxic waste, concrete bunkers and fuel storage tanks, it also featured 70-foot bluffs rising above the waters of Lake Michigan. 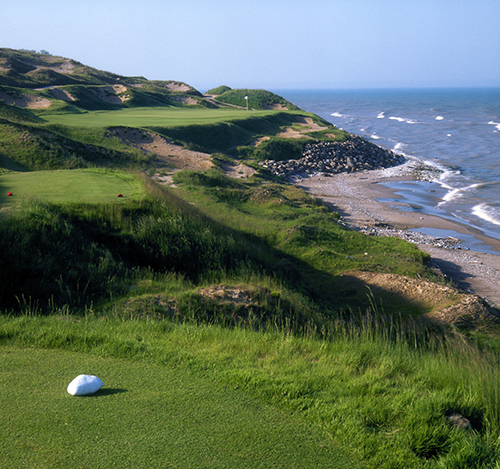 Though he didn’t take up the game until he got into the golf business himself, Kohler had quickly developed an affinity for links golf, whose roots are in the seaside courses of the United Kingdom. “I want this course to look like it’s in Ireland,” was the directive handed down. The course got its name when Kohler, walking the lakeside landscape in ultra-blustery conditions during construction, noted that the wind was whistling through the bluffs, with whitecaps breaking on the rocky shoreline, or straits, of the lake. 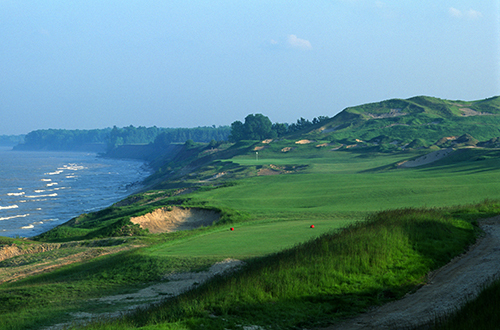 Hence the name Whistling Straits. Former U.S. Open Champion Dustin Johnson knows all too well how ubiquitous the bunkering is. In the latter stages of the 2010 PGA Championship at The Straits, he inadvertently grounded his club in what he thought was just a heavily trampled area, only to be told later he was assessed a penalty for grounding his club. He missed out on a playoff, eventually won by Germany’s Martin Kaymer. Though the sheer number of sand blowouts are nigh uncountable, at least those pock-marking the fairway play as waste bunkers. Grounding the club, removing loose impediments, and taking practice swings are all within the letter of the law, and thank goodness for small mercies. One other mini blessing is that ten or even fifteen percent of the bunkers are strictly window dressing—there’s virtually no way on God’s green earth they should be accessed. But then again, put a twice-a-year golfer on one of Pete Dye’s pain paragons, and anything can happen. And because the fescue grasses are generally wispy and thin, offline tee shots are usually found (by the competent, and mandatory caddy) and easily advanced. Another advantage is the sand-based fairways, which drain quickly and efficiently. The Straits and the neighboring Irish Course (the fourth Pete Dye course on property) have been known to be open, playing firm and fast, while the original, inland courses at Destination Kohler were literally bogged down by precipitation.